KUCHING: Entrepreneurs in the state have been called to advertise on radio in order to reach a bigger market. Majais said radio advertising is an effective and efficient medium that can deliver the message to both urban and rural areas. 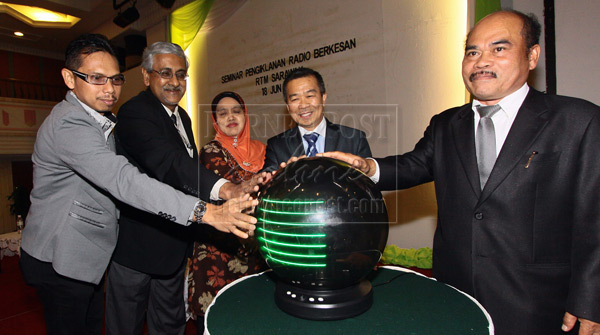 “Radio advertisements can be aired numerous times and the promotional messages will definitely be heard by many listeners including consumers and target groups,” he said yesterday when launching the Radio Televisyen Malaysia (RTM) Sarawak Effective Radio Advertising Seminar 2013. Naroden said radio advertising is a smart alternative because “radio possesses a certain amount of leverage in which what is being aired can be heard in rural areas without any line of communication as well”. Meanwhile, RTM Sarawak (TV Section) assistant director Abang Sulaiman Abang Toh said RTM Sarawak has radio stations throughout the state including Sarawak FM (88.9 MHz), Wai FM (101.3 MHz), Red FM (91.9 MHz), RoSa FM – Sri Aman (89.5 MHz), Sibu FM (87.6 MHz), Bintulu FM (97.5 MHz), Miri FM (95.7 MHz) and Limbang FM (104.9 MHz). are able to advertise their respective products while also increasing the number of sales,” he said. and Sri Aman learned about various methods of radio advertising.